NEWPORT NEWS, Va., Jan. 31, 2006 (PRIMEZONE) -- Northrop Grumman Corporation (NYSE:NOC) has been awarded a contract from the U.S. Navy for maintenance work, known as a depot modernization period, on the nuclear-powered submarine USS Toledo (SSN 769). The initial planning contract is valued at approximately $34.7 million. The total estimated value, including the actual execution, is valued at approximately $175 million. A photo accompanying this release is available at: http://media.primezone.com/noc/. Northrop Grumman's Newport News sector is the prime contractor for the work, which will include planning and scheduling, engineering, material procurement, fabrication, maintenance and modernization work. The ship is scheduled to arrive in September for a performance period lasting approximately 13 months, 10 of which will include dry dock work. Planning work will begin immediately. This is a competitive award under a Naval Sea Systems Command (NAVSEA) multiple award contract. 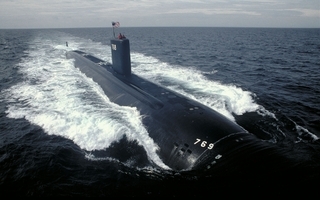 Toledo is the 26th Los Angeles-class submarine built by Northrop Grumman Newport News. It was christened on August 28, 1993 and commissioned into service February 24, 1995.